During the week of Feb. 18, Wheel of Fortune has teamed with sister company Sony Music Nashville to give viewers the chance to win a trip to Las Vegas to attend the 54th ACM Awards® or albums from artists including Kane Brown, Luke Combs, and Dolly Parton. 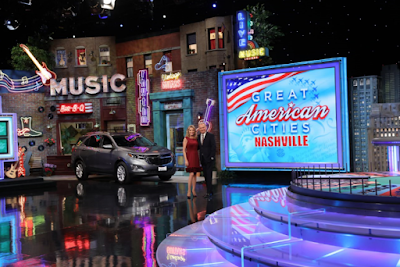 The giveaways correspond with the game show’s “Great American Cities: Nashville” theme week. From Feb. 18-22, music fans and “Wheel” watchers can enter the “54th ACM Awards Weekend Flyaway” for a chance to win a trip to the 54th ACM Awards on April 7 in Las Vegas, by visiting www.wheeloffortune.com. The grand prize includes airfare for two, two nights of hotel accommodations, two tickets to the star-packed 54th ACM Awards, two official ACM Awards After Party tickets, two Sony Music Nashville Whiskey Jam passes, and ground transportation between the airport and hotel. Also, fans will want to play Wheel of Fortune’s daily “Toss Up on Twitter” to win an album from Sony Music Nashville artists. Albums include Experiment by Kane Brown, This One’s For You Too from Luke Combs, Hallelujah Nights from LANCO, Dumplin’ Original Motion Picture Soundtrack from Dolly Parton, and Telling All My Secrets from Mitchell Tenpenny. To play, fans will need to follow @WheelofFortune on Twitter and compete against other Wheel fans to be the first to solve new puzzles each weekday. Daily winners will be notified on Twitter via Direct Message from the @WheelofFortune account. On the air, Wheel of Fortune will feature Nashville as one of its “Great American Cities.” Music City will be showcased during the week with a custom set featuring well-known landmarks, contestants from the Nashville area, and pre-recorded messages from Sony Music Nashville’s roster of artists. The local affiliate, WKRN News 2, held sweepstakes to allow some lucky Nashville viewers to fly to Los Angeles to be part of the studio audience. In preparation for the shows, hosts Pat Sajak and Vanna White shot customized segments at the historic Ryman Auditorium, the Mother Church of Country Music, and the iconic Grand Ole Opry with SMN newcomers Carlton Anderson and Rachel Wammack respectively. For local market TV affiliates and broadcast air times, visit www.wheeloffortune.com.